Those were the words that Hazelwood Officer Timothy Benning recalled from one of his mentors when he started out as a young officer for Jennings. As of Jan. 16, the St. Louis native has served as a police officer for 36 years. Benning began his service in law enforcement in 1982 and has spent the last 30 years serving Hazelwood. Benning, who was awarded a Police Officer of the Year Award by the Florissant Rotary Club in December 2018, shares what it means for him to serve the community, particularly as a school resource officer for Hazelwood West Middle School. Benning applied and received the position. He shared that Hazelwood was one of the first police departments along with St. Louis County to have a school resource officer program. He served as a resource officer from 1997 to 2002 before transitioning to the detective bureau for a while. He returned to the resource officer role in 2008. The greatest impact he believes he has had as a resource officer is making a positive impact on how youth view law enforcement. The thirty-six-year law enforcement veteran, who has announced his plans to retire this year, is not only leaving a legacy with youth but also with families. He shared that as a young officer he saw other officers who during a call would go to a house and find it without heat during the cold temperatures and resort to privately paying the gas bill or providing blankets and space heaters out-of-pocket. During the Christmas season of 1994 he was part of a call to a residence that included an additional family due to loss of their home which resulted in some household tensions. Benning suggested to other officers that they work together to provide some needs to the family to help better their experience during the holiday. The department ended up adopting three additional families for Christmas of 1994. The Hazelwood Police Department’s Benevolent Association that was originally set up to primarily assist officers in need as well as the department’s civilian employees, functions year-round. In its bylaws there are stipulations that allow the association to provide some support to family needs within the community. The association agreed to become a partner in the Christmas initiative which became the Help Families in Need program. In 1995 the initiative served seven families and has grown in service yearly. Under the guidance of Benning, the program has served over 300 Hazelwood families to date. 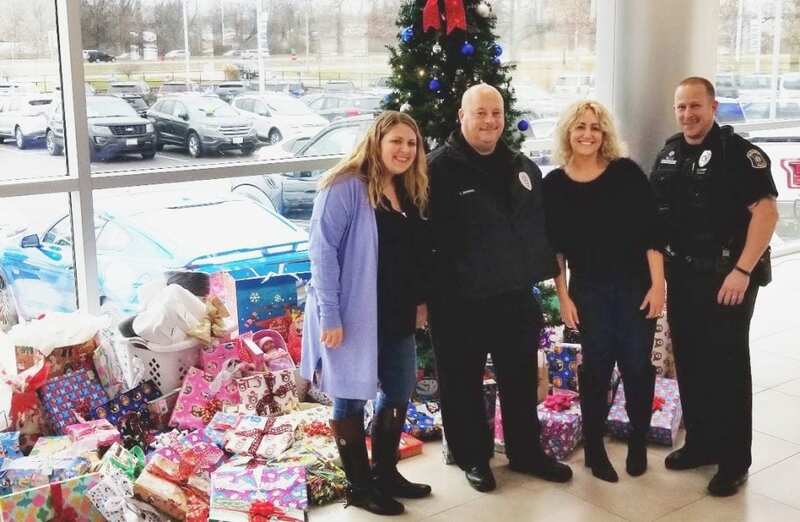 This year, 14 families were sponsored due to families being adopted by bioMerieux, Bommarito Ford Superstore, Nature’s Bakery, Burner Design & Control, and the Hazelwood Police Department. In addition, students of McCurdy Elementary School (Florissant) held a gift drive and donated approximately 50 gifts for the families, and city employees and residents made generous contributions towards the families. The program utilizes information from a domestic violence and victims advocate to determine the individuals that will be assisted through the program each year. Other referrals may also come through the department’s chaplains, churches, or other community resources. When Benning became an officer in Jennings, he had two mentors there. He credits them both in ensuring he understood the need to build bridges in the community and that his service as officer was not just a job. “Their philosophy and their guidance (somewhat) taught me that,” stated Benning. “(Also) I was with some policemen that don’t like a lot of attention, they don’t like to be singled out. They don’t do it for the praise or recognition.